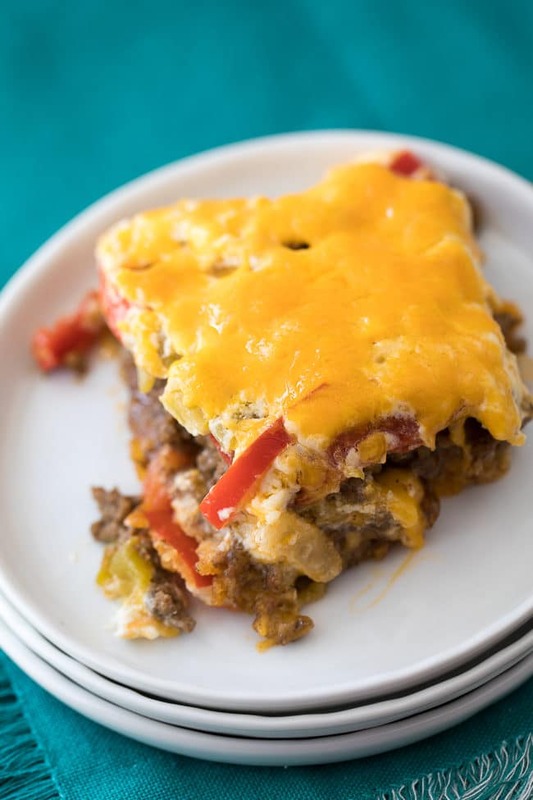 I’ve been seeing variations of this recipe in church cookbooks for years, but, what is John Wayne casserole? After doing a little research on John Wayne casserole, I found an interesting story. 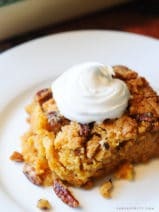 For my family, this recipe is summed up in one word—DELICIOUS! I’ve seen so many variations of John Wayne casserole over the years. Some of those variations have meat and some don’t. 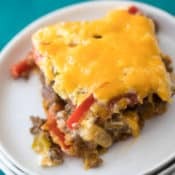 I like to add ground beef to my John Wayne casserole, but you could certainly add ground turkey or skip the meat completely. It really just depends on what your family prefers. 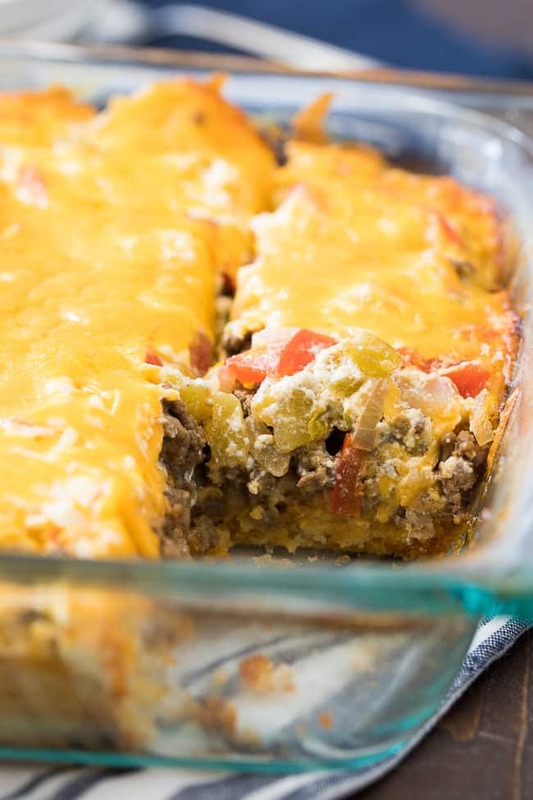 Since I usually have a few pounds of ground beef in the freezer begging to be utilized, I love adding it to this recipe to create an easy and hearty weeknight meal. Honestly, this casserole recipe usually looks like a big cheesy mess. I’m not going to lie! Luckily, this cheesy mess happens to taste absolutely amazing. I was a tad bit skeptical the first time I put this John Wayne casserole together, and I can remember my husband giving me a bit of a side-eye, wondering what I was making. One bite put our questions to rest. 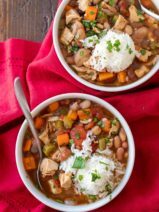 Even the kids enjoy this flavorful and simple family meal. I’m so glad that I finally gave this recipe a whirl. 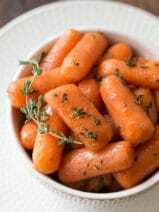 It has gone into our regular recipe rotation and my kiddos often ask for this recipe by name. Well, they ask for “that one casserole with the weird guy’s name.” Haha! Maybe it’s time to introduce them to the John Wayne film archive. Actually, maybe it’s time for ME to watch some John Wayne flicks. The Quiet Man was just recommended to me by one of the ladies in my Sunday school class. Is it as good as I’ve been told? Back to the food! I think I’ve probably mentioned it more than once before, but, I’m just such a fan of casseroles, especially during the busy school year. If you’re looking for more easy family recipes be sure to check out my tasty Mexican tater tot casserole, these simple ground turkey stuffed peppers, and my amazing chicken spaghetti recipe. I hope you love my variation of John Wayne casserole! This simple and hearty casserole recipe is a family favorite in my home! Preheat oven to 325 degrees. Lightly spray a 9 x 13 inch glass baking dish with non-stick cooking spray. In a small bowl mix together the biscuit mix and ⅔ cup water to make a soft dough. 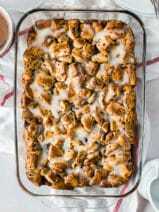 Press the dough into the bottom and up the sides about ½ inch in the prepared baking dish. The dough was a little sticky so I used parchment paper to press it out on the bottom and i used a spatula to bring it up the sides. In a small bowl mix together the mayonnaise, the sour cream and half the cheese. Set aside. Spread the ground beef mixture evenly over the biscuit layer. Evenly layer the sliced tomatoes over ground beef mixture. Evenly layer the green chilies over the tomatoes. Evenly spread the sour cream mixture over the green chilies. Top with remaining cheese. Bake for 30 to 35 minutes or until edges are lightly browned. This is a delicious recipe. i made it tonight for dinner and it was delicious. i used canned tomatoes and added sliced button mushrooms. I just made this delicious casserole today. My husband and son loved it! I will make it many more times in the future. my changes: i used ground turkey and while it was browning i added 8 oz sliced button mushrooms, the red bell pepper, diced onions. after the veggies were tender i added a packet of mild taco seasoning then i added 1 each 14 oz. can of diced tomatoes, undrained. i didn’t add the water because the tomatoes provided enough liquid. I baked the biscuit crust 10 minutes by itself then i poured the skillet contents in it. then i followed the topping directions as in recipe and baked the casserole for 25 minutes. then i added the remaining cheese and put it back in the oven 5 min to melt the cheese. it was really delicious. thank you for the recipe and inspiration. Donavan’s reef, Harti, Mc Clintock, the sons of Katie Elder, he has a lot of “must see” movies. Years ago I belonged to a recipe chain letter. This one came from Marcia Sirringhra? 2 cans chopped green chiles, 1lb montery jack cheese, 1 lb. cheddar cheese, 4 egg yolks and whites, 2/3 cup evaporated milk, 1T flour,1/2 tsp. salt, 1/8 tsp. pepper, 2 tomatoes (garnish). Grate cheese into buttered glass casserole with chopped green chiles mixed in. Beat egg whites to stiff peaks (set aside). Mix together flour, salt, pepper and egg yolks with evaporated milk. Fold the egg mixture into egg whites. Pour over cheese and press in. Bake at 325 degrees for 30mins. Place tomato slices over top and bake for 30 mins. longer. YUM!!!!! I’m always looking for recipes that use ground meat. Although I use primarily ground elk. This sounds like a winner. I did wonder if I might try lining the casserole with flour tortillas. We get wonderful ones at a tortilla place nearby. They smell like fresh baking powder biscuits. Mmmmmm. Worth a try, doncha think?! 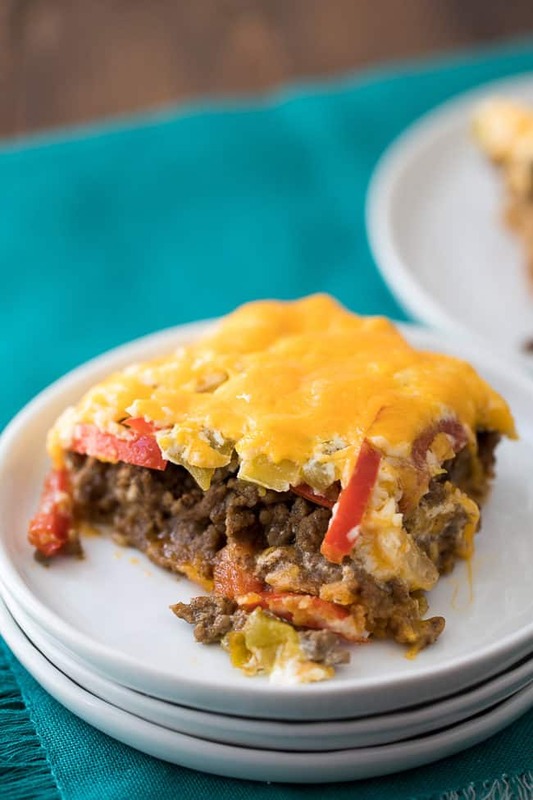 This recipe is called Impossible Taco pie on the Bisquick box! I’ve been making it for years. The Quite Man is a must see for John Wayne fans, one of the best John Wayne Maureen O’Hara films. How have I never seen this before? This is right up our alley. And – The Quiet Man is one I watch every St Patricks Day. Wonderful movie! The Quiet Man is as good as the casserole. It has lovely Irish scenery, romance and action. thanks for this version of the casserole. Pravina Doesn’t sound bad if you use a combination of chili powder and cumin instead of the taco seasoning mix. That would cut out some of the salt. If you need the filling to be a little thicker use a little flour or cornstarch. I think you could skip the mayo and sour cream. Just use a dollop of reduced fat sour cream on each piece. Yes Crissy, the Quiet Man may be our favorite John Wayne movie. It starts a little slowly but the story builds until you will be on the edge of your seat. Our other favorite is The Searchers. canned tomatoes nstead of tomatoes n chilies. Quicker, lol.. I can confirm that The Quiet Man is a wonderful movie; it’s my all-time favorite movie. Humor, drama, romance, gorgeous Irish scenery. If you want one more John Wayne film that absolutely *must* be seen, it’s got to be The Man Who Shot Liberty Valance. One of the *greatest* films ever made. Completely riveting, from the beginning to the very last scene. Absolutely brilliant, one of John Ford’s best. Plus it has Jimmy Stewart, Lee Marvin (as the ultimate bad guy Valence), Andy Devine, and a host of Ford’s usual cast.